We show that the line digraph technique, when iterated, provides dense digraphs, that is, with asymptotically large order for a given diameter (or with small diameter for a given order). This is a well- known result for regular digraphs. In this note we prove that this is also true for non-regular digraphs We show that the line digraph technique, when iterated, provides dense digraphs, that is, with asymptotically large order for a given diameter (or with small diameter for a given order). This is a well-known result for regular digraphs. In this note we prove that this is also true for non-regular digraphs. 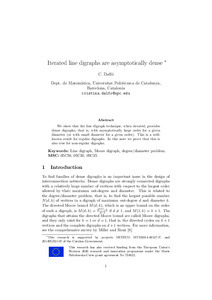 Dalfo, C. Iterated line digraphs are asymptotically dense. "Linear algebra and its applications", 2017, vol. 529, p. 391-396.